Spoil yourself this month by indulging in the revitalizing Anti-Fatigue Face and Back Treatment. This two-part treatment includes a 30-minute back treatment followed by a 30-minute mini-facial treatment. Your back treatment will commence with a 10-minute massage with the Anti-Fatigue Complex, containing sandalwood and rose geranium extracts. This relaxing yet energizing blend will ensure that you feel totally revitalized post-treatment. A back masque is then applied, during which time you will be encouraged to relax. When the masque is removed, a body treatment lotion will be applied. Your therapist will then ask you to turn over. The facial treatment begins with a cleanse, tone and exfoliation A relaxing facial massage with the Anti-Fatigue Complex ensures increased penetration of the active ingredients. 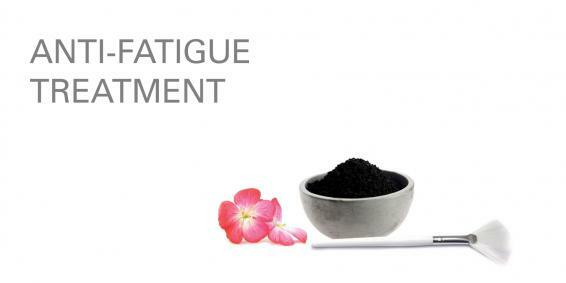 The application of the Anti-Fatigue Masque, containing black silt and geranium, increases micro-circulation – resulting in a radiant complexion. The products used during this treatment have not been evaluated for safety during pregnancy and are therefore not recommended for use during pregnancy or breast feeding.